I just received several cuttings from various succulents. This was the only one that was an unknown. 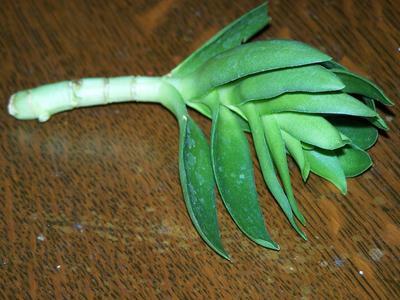 It is bright green with a thick stem and leaves that are in a close group at the top. I have a couple of stems and some individual leaves. Any help identifying this would help me know how to properly get it growing. Thanks! Hi Erin, I'm going to suggest that this is some type of Crassula, based on the way the leaves are arranged; opposite, and clasping the stem. This is a characteristic of this genus. I don't know the species but that might get you going in your research. You can see more about Crassula here. My feeling is that this plant shouldn't have any trouble rooting and growing, as long as you don't overwater it. I'll be waiting to hear if you find out any more about it. Comments for Bright green succulent. Thanks again for another ID! I'll research it further and see if I an find something specific.